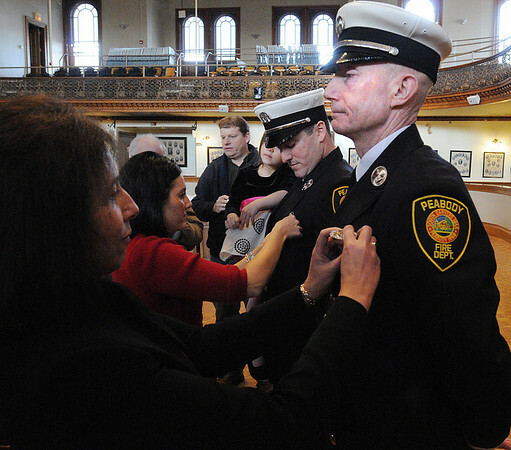 Timothy O'keefe, far right, gets pinned by his wife, Ann-Marie and Dale Kimball, second from the right, gets pinned by his wife, Stacy, during the swearing in ceremony at Peabody city hall on Wednesday morning. Two Peabody Fire fighters received promotions. Dale Kimball is promoted from fire Lt. to fire capt. and Timothy O'keefe is promoted from fire fighter to fire Lt.
Photo by Ken Yuszkus/Salem News, Wednesday, February 9, 2011.